Sno-King School Retirees, Unit #23, is a member of the Washington State School Retirees Association. 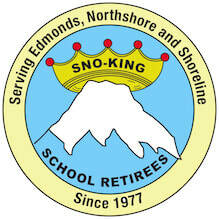 Sno-King School Retirees was organized in 1977 and represents active and retired education employees in Edmonds, Northshore, and Shoreline School Districts. Thursday, May 16, Joint-Sno-King/Sno-Isle Luncheon--Currently the Sign-up List is full, there is a wait list, See Events.